I’ve been working my way through a 12oz. package of bacon, 3oz. 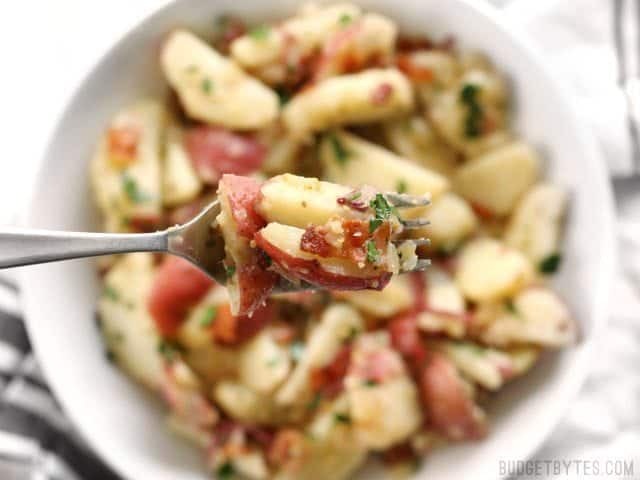 at a time, and today’s German Potato Salad is the third recipe I made with that bacon (I’ve already made Spaghetti Carbonara, a Bacon and Caramelized Pineapple Pizza). When I buy a package of bacon, I cut it into quarters, freeze it in a gallon-size freezer bag, and then use one three-ounce section at a time. Bacon has such a strong flavor that I find you only really need a small amount to flavor an entire recipe. 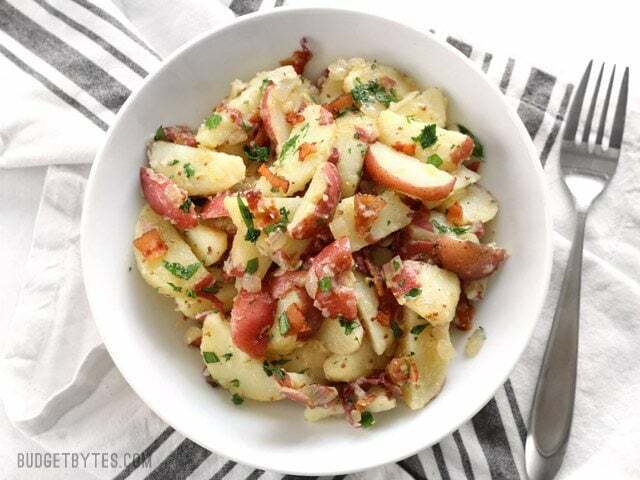 I love the tangy vinegar-mustard dressing on this German Potato Salad, which despite using all the bacon grease, seems so much lighter than traditional mayonnaise based potato salads. And it was the perfect contrasting flavors to my sticky sweet Glazed Pork Chops that I remade this week (Don’t miss the video I added to the post!). I really love how fast and easy this potato salad is. Because I made a slightly smaller batch (I only used 2 lbs. 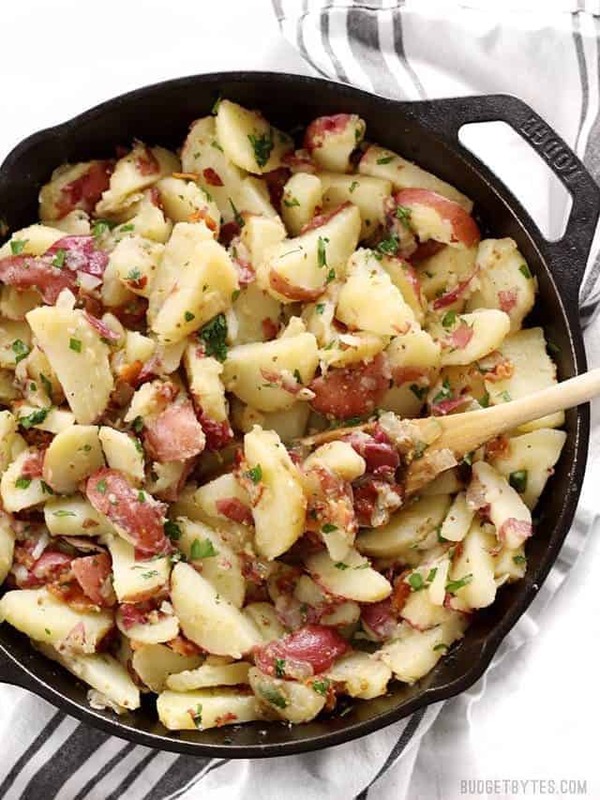 of potatoes), I was able to stir together everything for the salad right in the skillet that was used to cook the bacon, and avoided using an extra bowl. 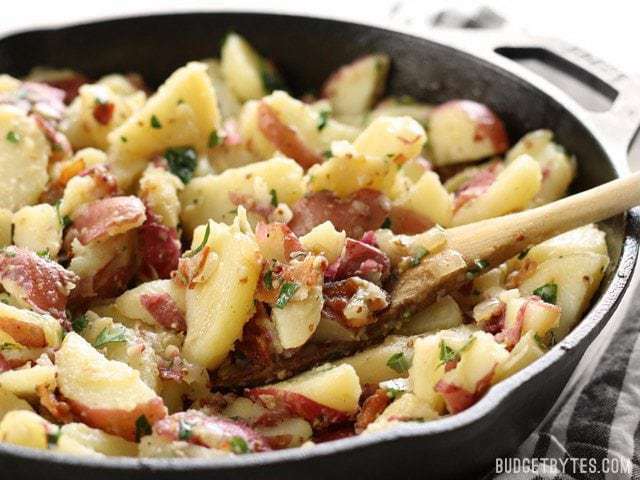 All the salad components can be prepared while the potatoes cook, so this German Potato Salad practically comes together in the time that it takes for small potatoes to boil (about 15 minutes). That’s the kind of meal prep I like. Fast and efficient, with no down time. Because GURL, I’ve got things to do and places to be. Right?! Right. So let’s get on with this show. 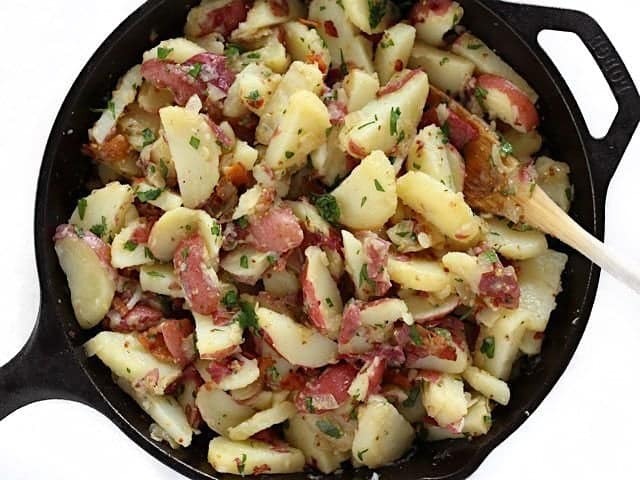 German Potato Salad is coated in a tangy bacon vinaigrette and is the perfect side for all your summer grilling. Scrub the potatoes well, then add them to a large pot with enough cool water to cover the potatoes by one inch. Add approximately 1/2 Tbsp salt to the cooking water. Place a lid on the pot, turn the heat on to high, and bring the pot to a boil. Continue to boil the potatoes until they can easily be pierced with a fork (about 15 minutes). Meanwhile, prepare the dressing. 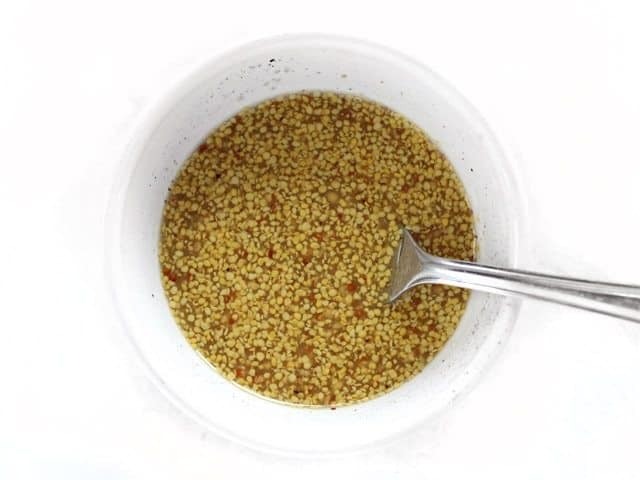 In a small bowl stir together the apple cider vinegar, coarse ground mustard (or Dijon if preferred), sugar, some freshly cracked pepper, and about 1/2 tsp salt. 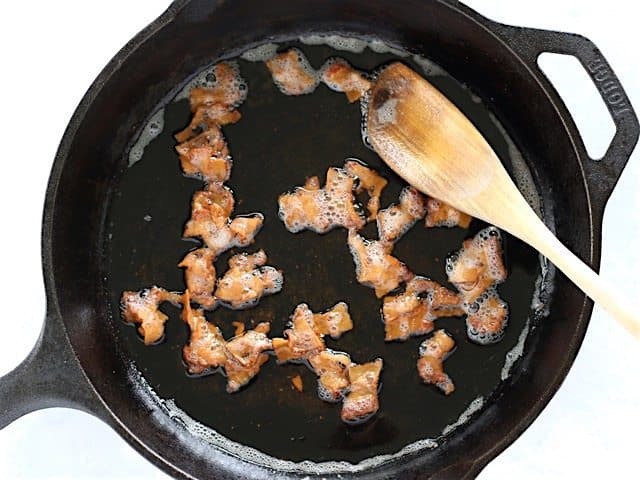 Cut the bacon into one inch pieces and add them to a large skillet. Sauté the bacon over medium heat until brown and crispy. Remove the bacon from the skillet and place it on a paper towel lined plate to drain. Leave the remaining bacon grease in the skillet. While the bacon is cooking, dice the onion. 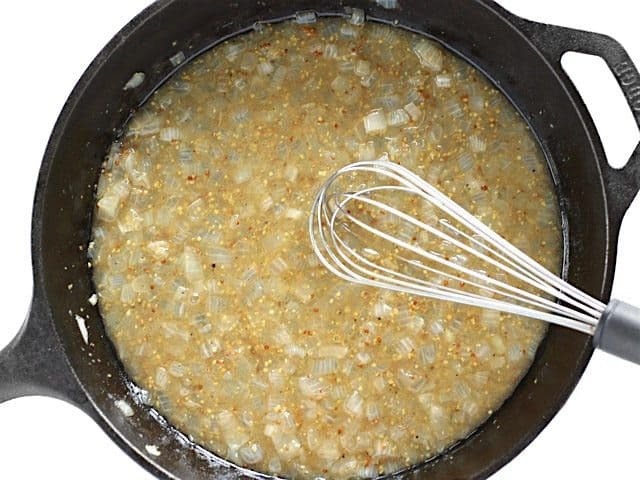 After removing the bacon, add the onion to the skillet and sauté it in the leftover bacon grease until the onions are soft and transparent. Turn the heat off. Add the prepared dressing and whisk until the dressing is well blended with the bacon fat and it has thickened just slightly. Once the potatoes are tender, drain them in a colander. Let them cool for a few minutes, or just until they are cool enough to handle. Slice the potatoes into 1/4-inch thick medallions or half moons. 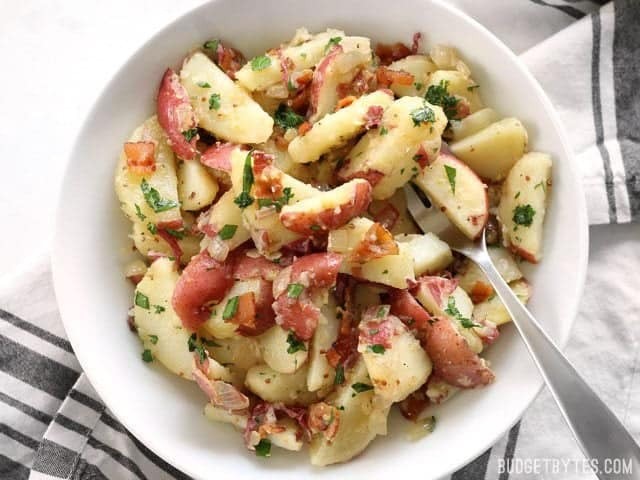 Add the sliced potatoes, cooked bacon, and chopped parsley to the skillet with the dressing. Stir to combine. Serve immediately while the potatoes are still warm. Wash 2 lbs. 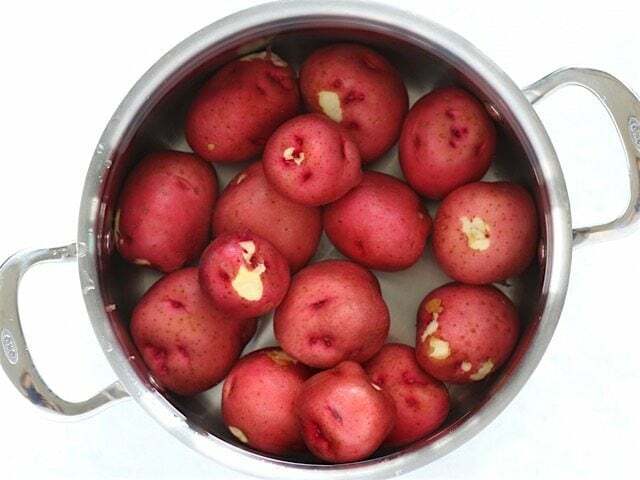 of small red potatoes well. Place them in a large pot and add enough water to cover them by one inch. Add about 1/2 Tbsp salt to the water to make sure the potatoes are well seasoned. Place a lid on the pot and turn the heat on to high. Bring the pot to a boil, then continue to boil the potatoes until they are tender enough to be easily pierced with a fork (about 15 minutes). Meanwhile, prepare the mustard vinaigrette. In a small bowl stir together 1/3 cup apple cider vinegar, 1 Tbsp coarse ground mustard (or Dijon, if you prefer that), 1 Tbsp white sugar, some freshly ground pepper (maybe 15-20 cranks of a pepper mill), and 1/2 tsp salt. Slice 3oz. of bacon into one-inch strips. Cook the bacon in a large skillet over medium heat until it is brown and crispy. Remove the bacon to a paper towel lined plate, leaving the grease in the skillet. While the bacon is browning, dice one small yellow onion. 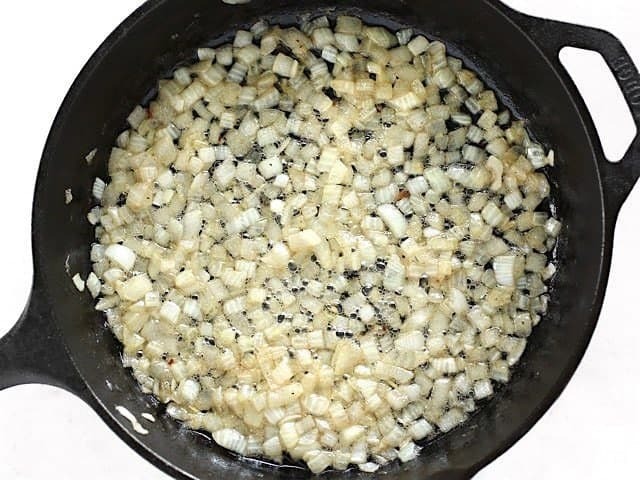 After removing the bacon from the skillet, add the diced onion and sauté it in the bacon fat until the onion is soft and transparent. Turn off the heat. Pour in the prepared dressing and whisk it into the bacon fat. It will create a slight emulsion and get just a LITTLE bit thicker. Once the potatoes are tender, drain them in a colander and let them cool for just a few minutes or until they are cool enough to handle. Slice the potatoes into 1/4-inch rounds or half moons. 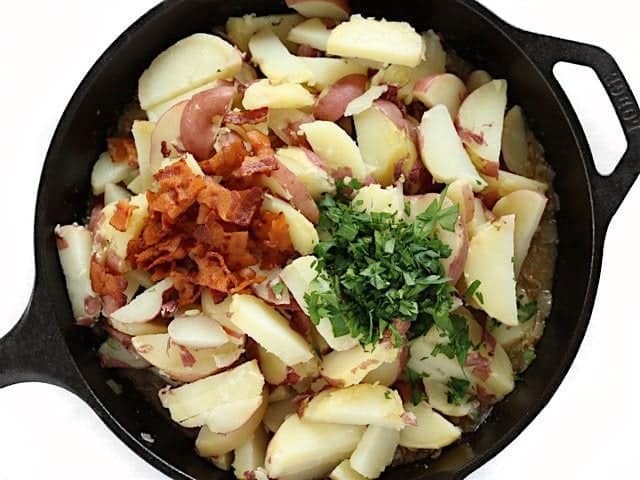 Add the sliced potatoes to the skillet with the dressing, along with the crisp bacon and about 1/4 cup of chopped parsley. Finally, just stir everything together until it’s coated in dressing! Ta-da! I can’t believe how incredible this turned out. I made it for a BBQ earlier this summer and have been specifically requested to make it again twice since then. Total hit and it’s one of my go-to recipes now if I’m going over somewhere. Thanks so much for sharing this! Any suggestions or advice when making this ahead for a crowd? Also wanted to add that I discovered your website about a year ago and recommend it to friends young and old alike. So many great ideas and your recipes always turn out. We entertain a lot and your recipes work for small dinner parties, for when I feed ex-offenders and their families for READ (family literacy night for 70), and for family dinners when I’m looking for inspiration with produce from the farmers mkt. Appreciate your creativity and talent for great flavor combinations. Hmmmm, honestly I’m not sure how this would work out when made ahead for a crowd. The dressing may get absorbed by the potatoes as its stored, so it might get a bit more dry.